Swap Store Hours Registration for sellers: Friday before the Swap (regular store hours) and Saturday morning before 9:45am. Swap Sale Hours: 10:00am to 2:00pm Saturday. What Is a "Swap"?Our "Swap" is a tent sale that we have at various times during the year. This is the only time that we carry used equipment. Anyone can bring in their old equipment to be displayed to the public. It is an excellent way to update or upgrade your gear and it is an especially good opportunity if you are just getting into a sport. Aside from used equipment, we also have our always great prices on new merchandise as well as "Swap Specials". Buying Information: The Swap opens at 10:00am Saturday, which is when you will find the best selection. Prices on all used equipment are fixed and bids are not accepted. Silent Sports staffs the Swap, not the owners of the used equipment. All sales are final and there are no warranties on Swap merchandise. Applicable taxes apply to all products. The used equipment is only at Silent Sports for the designated day and potential buyers cannot preview the equipment before the Swap opens on Saturday. 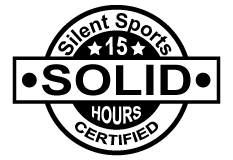 Certified Solid: Look for our certified solid logo on kites at our swaps. This logo means that we have inspected the kite ourselves, inflated it and left it inflated overnight (15 hours). Certified solid means it stays inflated, the kite may have some repairs on the canopy or leading edge. Please ask our staff on site if you have any more questions about a certified kite at the swap. Sometimes our swaps are too busy or weather conditions don’t permit you to carefully inspect used kites; this is something we do to help you buy used gear with confidence. All of our used kites on our website have been inspected and tested this way. This certified solid logo represents a kite we wouldn’t hesitate to use ourselves. Selling Information: The swap opens at 10:00am Saturday. The equipment must be registered by either the Friday before the swap or by 9:45am Saturday morning of the swap. Registration is open on Friday during store hours and Saturday prior to 9:45am. Silent Sports does not charge a registration fee. If the owner of the equipment sells their product then the owner has the choice of either taking a 100% store credit or 80% in cheque. The store credit does not have an expiry date and can be used for any purchase in the store. The seller must call to check if their equipment has sold, no credits are issued until the seller confirms the sale and choice of credit or cheque. If the equipment does not sell, the owner must pick up their equipment up before the swap closes or storage fees will be charged. Silent Sports will suggest a selling price for the equipment. The selling price is fixed for the weekend. Silent Sports is not responsible for the owner's equipment when the swap closes. What will I find at the Swap? The contents of the Swap depend entirely on what is brought in by our customers. We do not know in advanced what products we will have, although there is usually a good variety of styles and price. The best selection is available first thing in the morning. Please do not call ahead for product information. How do I find out if my item sold? To find out if your item has been sold, please call on the day of the Swap after 3pm only. Staff will then check to see if your item has been sold. Please be patient while staff verifies the sale, as the store may be much busier than normal. What happens if my item gets sold? You must call after the swap to see if your items sold. If they have sold, please specify whether you would like store credit to be applied to your account or if you would prefer a cheque. If you choose store credit, 100% of the total sale is available as store credit, and this will not expire. If you wish to collect the proceeds from your sale, 80% of the total will be provided by cheque at the store. What happens if my item doesn't sell? If your item is not sold, it is your responsibility to pick up the item before closing on the day of the Swap. Any items not picked are subject to storage fees. Silent Sports is not responsible for lost, damaged or stolen items. How much is my item worth? The price of the sale item is entirely at the seller's discretion. Our staff can give a rough idea of what the item might sell for based on its condition and what similar items are priced at. If you wish to increase the chances of selling your item, use the lowest price that you will be happy with.